With the storm yesterday passing to the east, with rain here in the Phoenix area, and snow up north, it's time to head back to Page for more hiking. A week or so ago I felt like I wanted to head to Southern California to see the desert bloom there, but I was busy with other plans. Well, the bloom came to me. 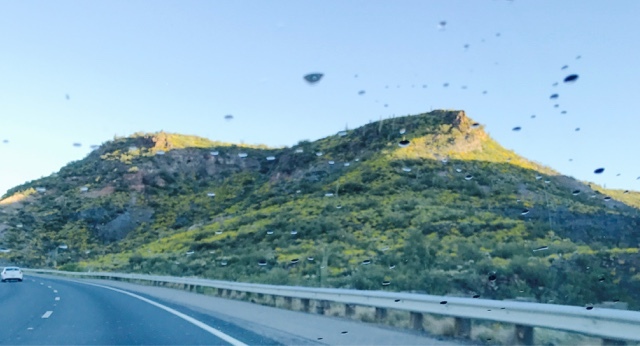 Here on I17 north of Phoenix the hills are bright yellow and green with spring flowers in full bloom. 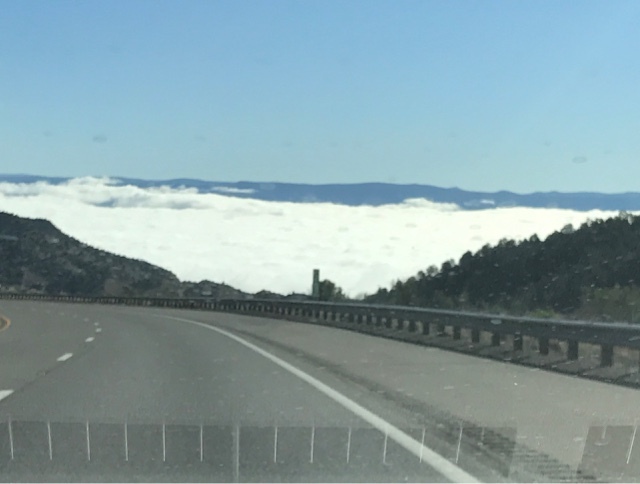 I couldn't stop on the highway for this picture, so through the windshield gives a poor picture of this hill blooming. The drops of water on the windshield is condensation that collected on the inside of my Prius last night. In part it collected from higher humidity from the rain yesterday, and low temperatures last night, but also from boiling water in the Prius for washing up last night. Although it is generally warmer to wash in the evening than a cold morning, you do create moisture that hangs around and condenses on the windows as the temperatures drop. The best time to wash is mid afternoon when humidity is low and it can escape from daytime warming. 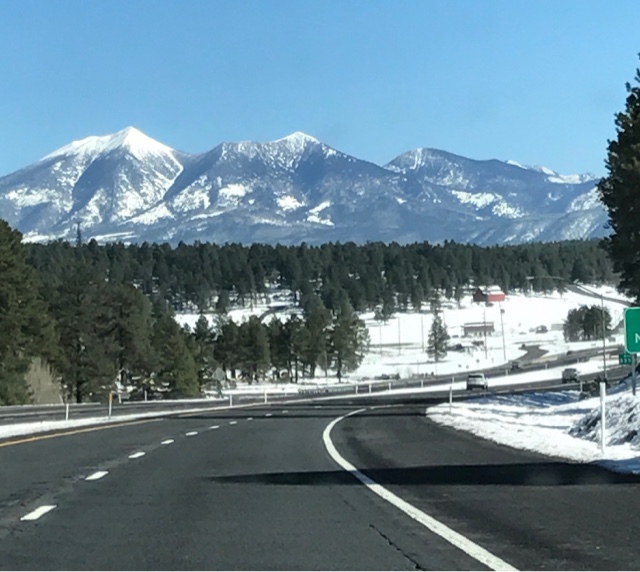 After a morning break, I'm headed north again on I17 towards Flagstaff. Here valley fog has collected in the morning chill. This is what I avoided yesterday by staying south until the storm passed. Flagstaff got a couple inches of new snow. I avoid snow if at all possible. 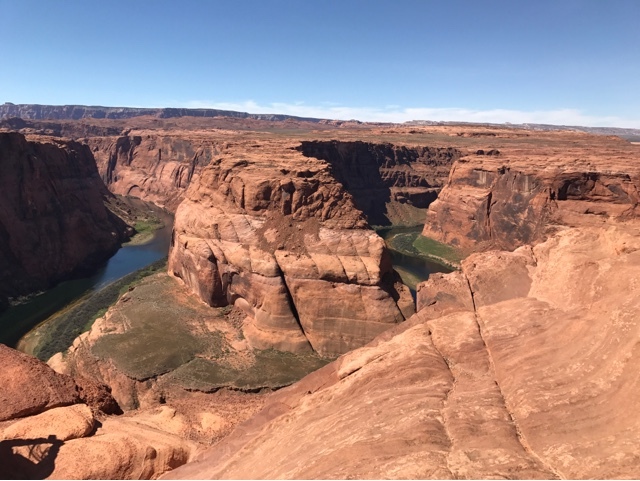 With too much behind the wheel driving, I decided to stop at Horseshoe Bend just 3 miles south of Page for the 3/4 mile walk to the canyon rim. 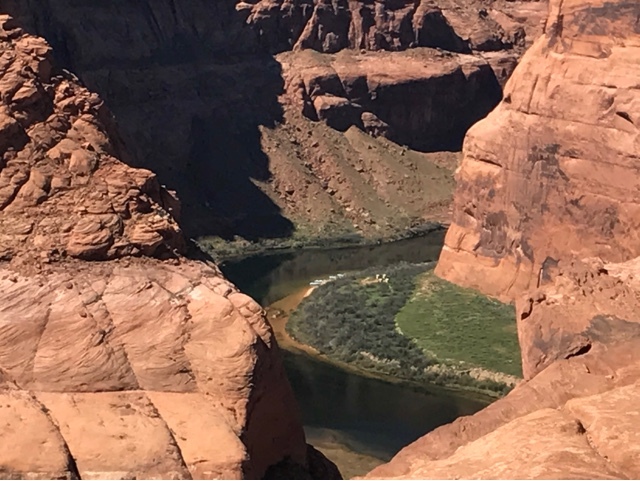 The above picture is the spot we stopped in the river rafting trip I recently took to see the petroglyphs on the canyon wall to the right.